Many years ago I came across a recipe for grits with eggs and a red sauce. It was similar to shakshuska, a Middle Eastern dish of baked eggs in red sauce, shown below, but with grits! I never had grits until my husband and I visited Charleston, South Carolina, for business a long time ago. We ate at a lovely restaurant And I hesitantly ordered shrimp with grits. I think I assumed grits would be too “corny” for me, but they’re not. They’re lovely, and just as much fun to cook as risotto. Below are pumpkin grits I made last fall. So many variations are possible. For grits, I prefer the coarse-grained variety, which do take longer to cook, but I prefer the texture. I’ve noticed that the words “polenta” and “grits” are both on the package now! There used to be much confusion about the difference, but there is no difference. To make it more complicated, grits and polenta are also cornmeal. 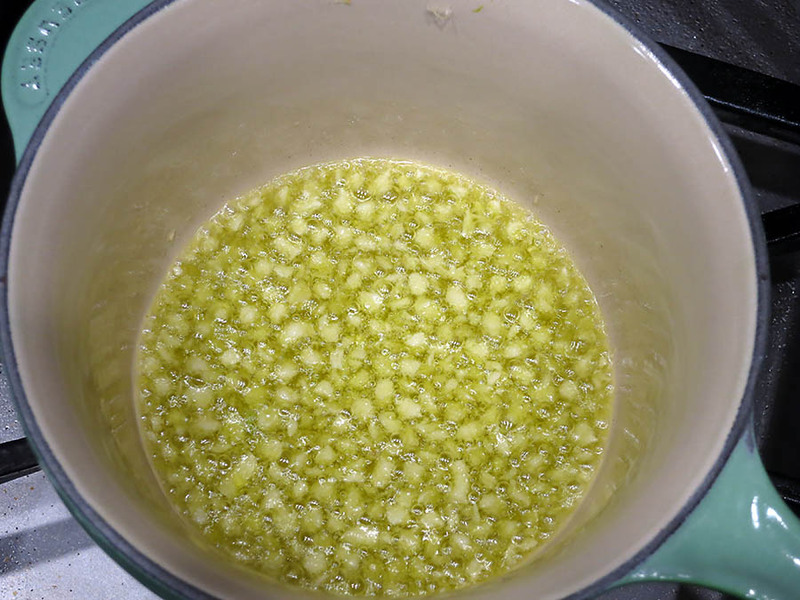 Place the water and butter in a deep pot over high heat. When the water boils, add the grits. Stir, and continue to stir, with the heat on medium. I always have about a cup of water handy to add to the grits as they thicken. It seems that more liquid is required than what is stated on the package recipe. After about 10 minutes or so, when the grits have cooked about halfway, add cream. Continue to cook the grits, and add even more water if necessary. When you feel the grits aren’t thickening up anymore, set them aside. Make the eggs sunny-side up, over-easy, poached, or soft-boiled. It’s your choice. I used 1 tablespoon of butter per egg and cooked them sunny-side up in a skillet. Add a little dab of butter right before they’re fully cooked. To serve, spoon the grits into a pasta bowl. 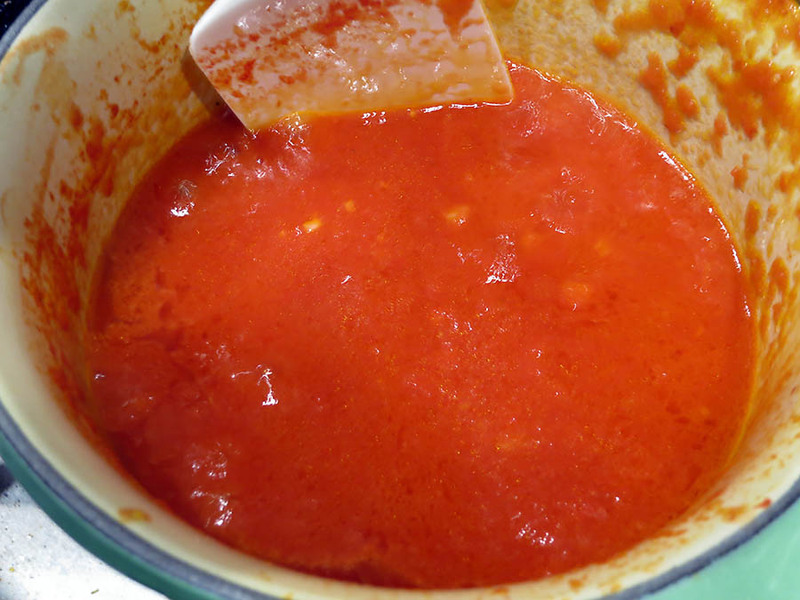 Place some heated red sauce over the grits and, using a spoon, form a hole in the middle. Then place the cooked egg in the hole along with any butter from the skillet. Crumble some goat cheese and sprinkle on top. You can also add chopped chives or parsley. It’s a wonderful and hearty breakfast, but I’d certainly eat this for dinner as well! If you wanted to bake the eggs in the grits, like in the original recipe, you must use an oven-proof serving dish or prepare all four servings in a skillet. But I would make sure that the grits are first on the runny side. They will thicken – especially in the oven. The first time I heard about gnudi, I was ecstatic. And I was also shocked that I hadn’t come across them before, in spite of the many Italian cookbooks I own. It was maybe only five years ago I saw them being made on television, and I knew one day I’d make them. I just sadly forgot about them, until today. Gnudi, simply stated, are the filling of ravioli. Or any filled pasta. No pasta involved. So they’re like the lazy man’s ravioli! Today, mine are simple, utilizing the richness and unique texture of ricotta. But any ingredients can be included with the ricotta, just as you would to make a spinach-ricotta filling, or a pumpkin-ricotta filling. They’re similar to gnocchi and spazele, except that there’s much less flour, which makes sense, since they are the filling and not the pasta. Here’s the recipe. Begin by whisking the eggs, yolks, and salt together in a large bowl. Add the ricotta and whisk well. Then add the Parmesan and whisk until smooth. Add the flour and fold into the ricotta mixture gently. If you feel more flour is needed – add more – but just a little at a time. The gnudi must end up tender. Sprinkle a cookie sheet or jelly roll pan with a light dusting of flour. Typically, gnudi are shaped into quenelles, which are beautiful ovoids. Unfortunately, even if I could make these forms, which requires two spoons, I wouldn’t be fast enough to get through the gnudi batter before the water completely evaporated. So I opted for a little cookie scoop. Dip the scoop in water, tap, then scoop up the gnudi. Place them on the floured sheet, and then sprinkle a little more flour over the top of the gnudi, using a fine sieve. Once you have finished with all the batter, let the gnudi sit for about 30 minutes. Meanwhile, get a large pot of water boiling on the stove. As I do with spazele, I always test one to get the timing right. In this case, my little 1″ round gnudi took 5 minutes to cook. You don’t want them raw in the middle, but you don’t want them to be like rubber. As with spazele, the gnudi will drop to the bottom of the pot, and about halfway through cooking they will come to the surface. When they’re cooked, remove them with a slotted spoon, and place them on a paper towel-lined platter. Once you know the timing of the gnudi, make them in batches until the batter is no more. I served these with a meat sauce (recipe below), but because I didn’t want the meat sauce to smother the delicate gnudi, I placed the sauce on the bottom of the bowl, topped it with the warm gnudi, and sprinkled on a little Parmesan. These ricotta-based gnudi are like soft little pillows of goodness. I would normally not pair the gnudi with such a heavy sauce, but my husband isn’t fond of meatless red sauce. Just like with gnocchi and spazele, the gnudi could be simply tossed in browned butter. * I only buy whole-milk ricotta, and I always let it drain on paper towels overnight or at least for 12 hours. It just makes the ricotta thicker and creamier. It’s amazing how much water comes out. I have to apologize. Seriously. To all of the people who followed me at the beginning when I was first writing this blog. I mean, I thought I was a good photographer. I really did. I had spent years taking pictures of my kids and my dogs. And I took lots of pictures on vacations. So that made me experienced, right? Then came food photography, which comes along with having a cooking blog. I thought it would be fairly straight forward. Mostly because I was one of those who’d always taken photos of my food at restaurants, and photos at farmers’ markets. I certainly didn’t think I was a pro. But I didn’t realize how bad I was. Maybe it’s for the best, because otherwise I maybe wouldn’t have pursued this blog. Because unfortunately, to have a cooking blog means you have to know how to cook, you need to be able to write, you must be a food stylist, and you have to take really good photographs. I had 2 out of 4 going for me. But like I said, ignorance is bliss. I didn’t realize any of this until recently when I decided to look at some old posts of mine. And I nearly fell off my chair. I’m not kidding. I deleted at least 10 immediately, and then thought about perhaps saving some as future, upgraded posts. It wasn’t the subject matter, or the writing. It was those awful photos. What little there were of them. 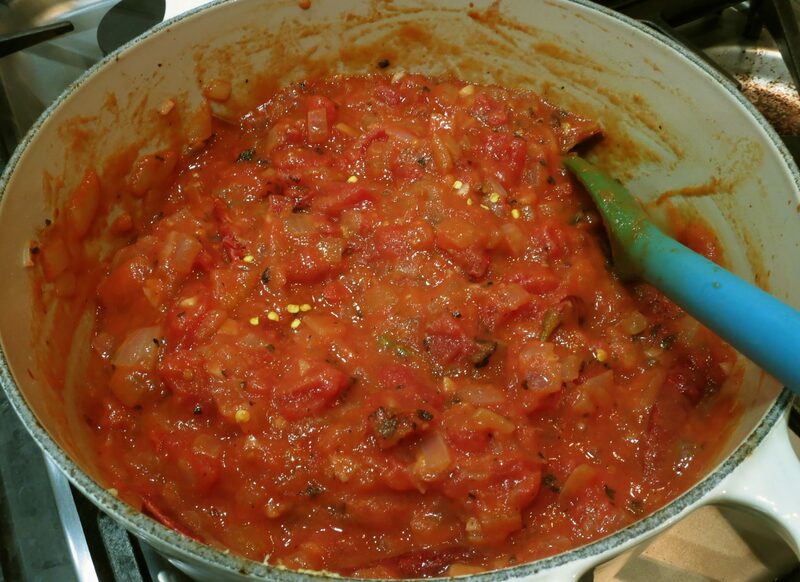 But my marinara really is so good, and so easy to make, that I decided to offer up a new post on my marinara, but with better photos. So here it is. Hopefully you never saw the old one. 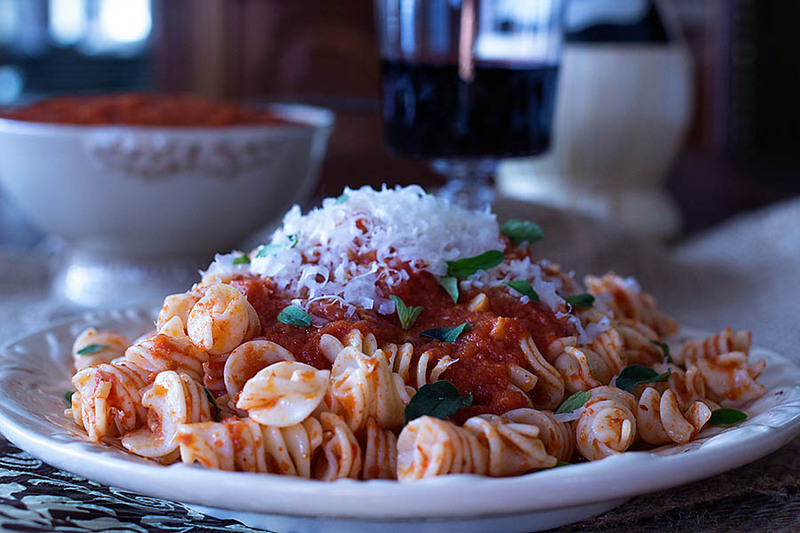 Marinara sauce is basically an Italian name for a red sauce that can contain quite a few ingredients, although never meat. Of course tomatoes are the base for the sauce, but other ingredients can include onions, garlic, celery, carrots, wine, and so forth. My marinara sauce contains three ingredients. There might be some dead Italians rolling in their graves when I make my marinara sauce, but that’s ok. No two living Italians can agree on what a marinara sauce is comprised of, so I’m off the hook. And I can talk about Italians, dead or alive, because I’m half Italian. Sicilian, actually, but I’m throwing them in the same proverbial Italian pot. First, heat up the oil over medium heat in a medium-sized saucepan. Add the garlic. Stir gently and wait just until the oil warms the garlic and you can smell it, then immediately pour in the tomato sauce. This should only take about 30 seconds. This is my technique for sautéing garlic because I do not like the taste of burnt garlic, and garlic can burn quickly. Stirring gently, heat the sauce and let it cook for about 10 minutes. It will thicken a little. (An inferior, more watery tomato sauce will take longer to thicken. If it’s too watery, try adding a little tomato paste.) Add the salt and stir. And so, that’s it ! This sauce is fabulous for a chicken or veal Parmesan, simply with pasta, as a dip, or even as a pizza sauce. But it’s my favorite with any kind of pasta. And with chianti, because the San Genovese grape is perfectly with red sauce. 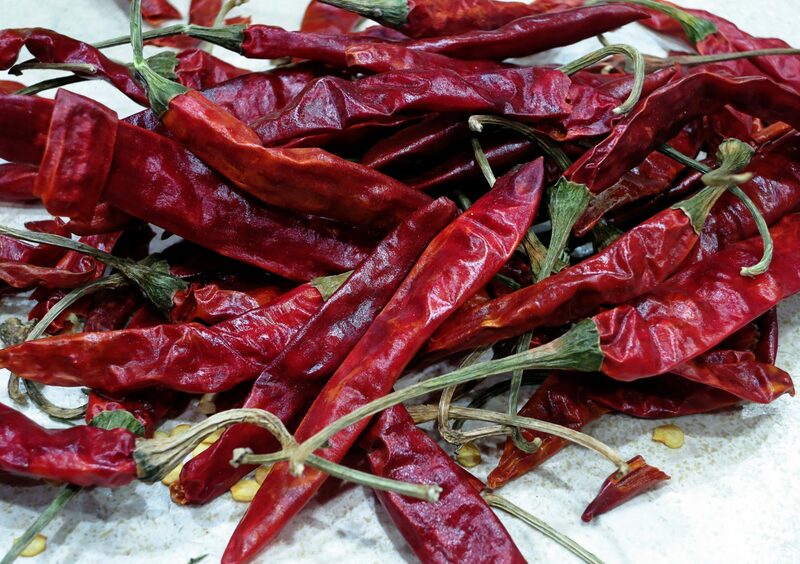 Especially with this garlic-spicy one. 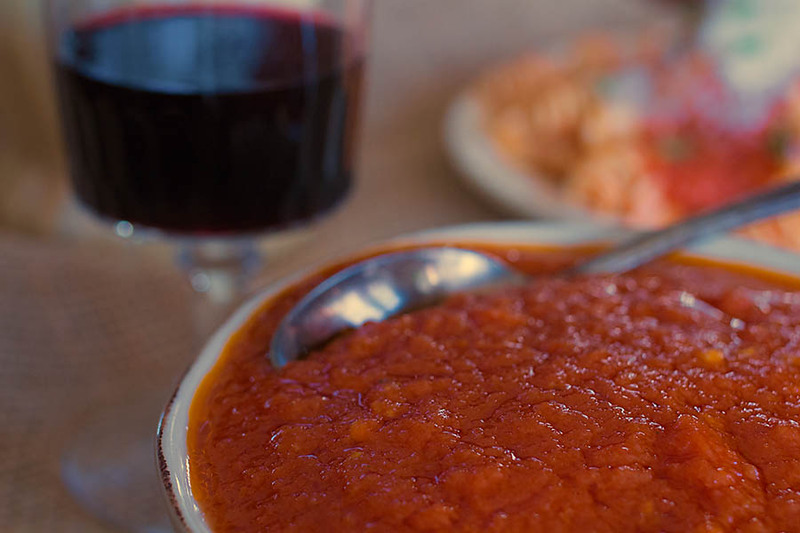 If you don’t want to call it marinara, don’t. 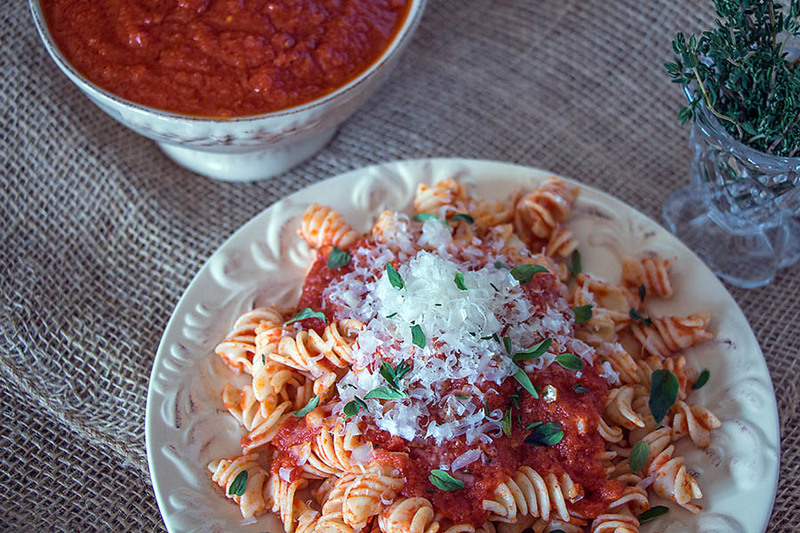 Just call it the best red sauce you’ve ever tasted. You’ll thank me! 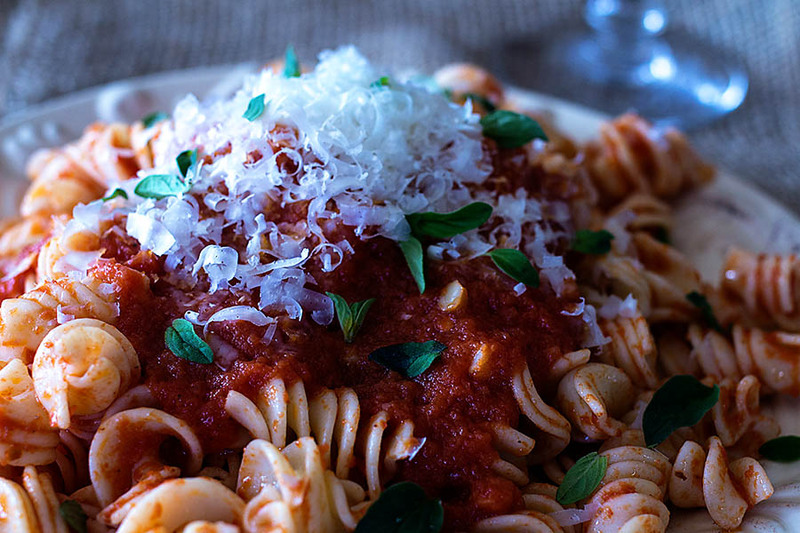 * Don’t be scared about the amount of olive oil in this sauce. It’s good for you and it adds a lot of good flavor, because you’re using good olive oil, right?